President Emilio Famy Aguinaldo is the country’s first and youngest president. Aguinaldo died on February 6, 1964 of coronary thrombosis at the Veterans Memorial Hospital in Quezon City. He was 94 years old. 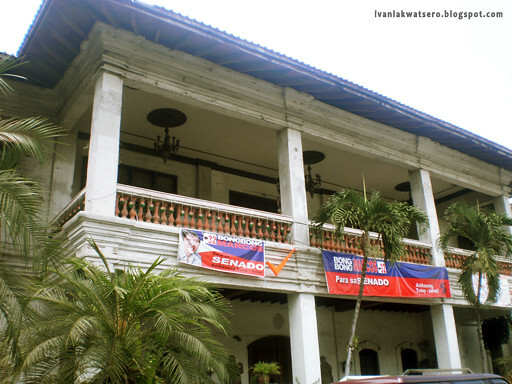 His remains are buried at the Aguinaldo Shrine in Kawit, Cavite. My Visit: June 12, 2011. I visited this tomb during the 113th Anniversary of the Philippine Independence. Read more here. President Manuel Luis Molina Quezon suffered from tuberculosis and spent his last years in a “cure cottage” in Saranac Lake, New York, where he died on August 1, 1944. He was initially buried in Arlington National Cemetery. His body was re-interred at the Manila North Cemetery before being moved to the Quezon Memorial Circle. My Visit: February 2, 2011. I've been here twice. My last visit was just last February. Read more here. On November 6, 1959, President Jose Paciano Garcia Laurel died at the Lourdes Hospital in Manila from a massive heart attack and a stroke. He is buried at the Public Cemetery of Tanauan City in Tanauan, Batangas. My Visit: October 12, 2011. Just made my visit a few hours ago. Check out the details here. President Sergio Osmeña, Sr. died of liver failure at the age of 83 on October 19, 1961 at the Veteran’s Memorial Hospital in Quezon City. 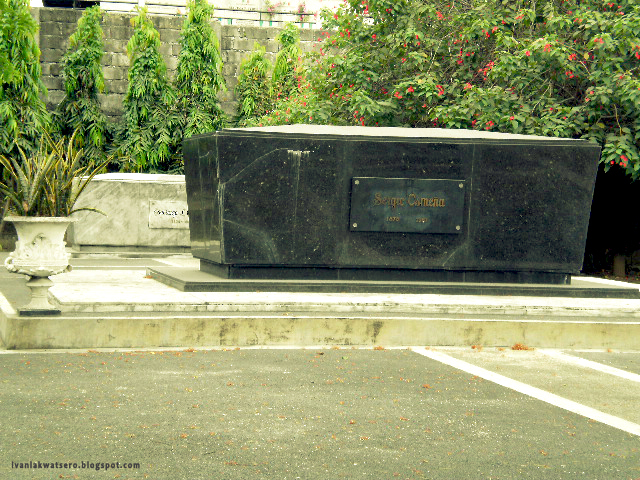 He is buried at the North Cemetery in Manila. My Visit: March 27, 2011. Visited this grave last March. Read more here. President Manuel Acuña Roxas did not finish his term because he died of myocardial infarction. 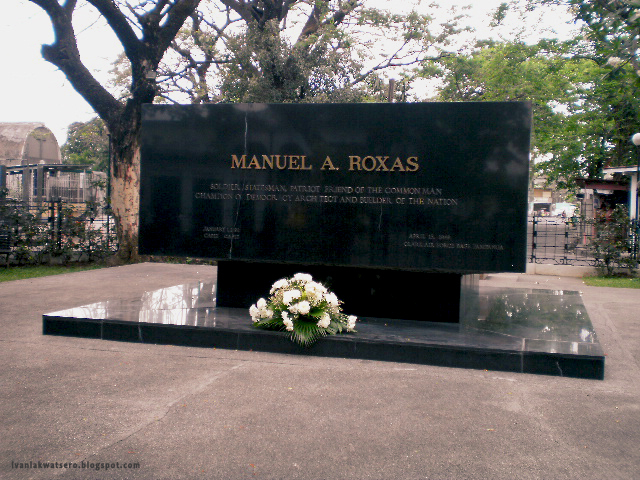 On the night of April 15, 1948, Roxas died at Clark Field, Pampanga after delivering a speech before the U.S. Thirteenth Air Force. He was buried at the Manila North Cemetery. My Visit: March 27, 2011. Also last March, I was able to visit this tomb. Read more here. President Elpidio Rivera Quirino died of a heart attack on February 29, 1956. He is buried at the Manila South Cemetery. My Visit: April 6, 2011. 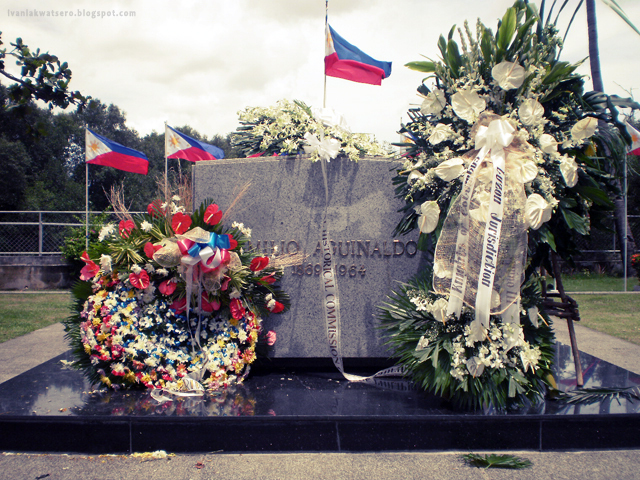 I visited the grave of President Quirino last April. Read more here. President Ramon Del Fierro Magsaysay. 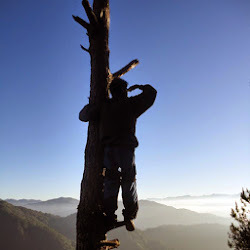 In the early morning hours of March 17, 1957, President Magsaysay's plane "Mt. Pinatubo," a C-47, crashed on Mt. Manunggal in Cebu killing 25 of the 26 passengers and crew onboard. 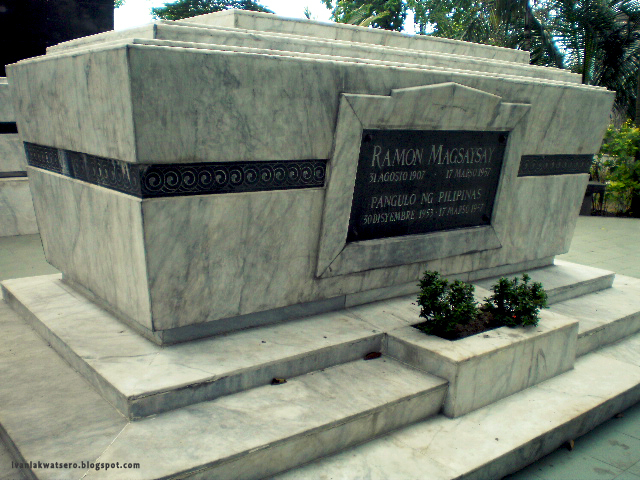 President Magsaysay was buried at the North Cemetery in Manila. My Visit: March 27, 2011. Still at the MNC, I visited this grave last March. Read more here. President Carlos Polistico Garcia suffered a fatal heart attack on June 14, 1971 days after he was elected as president of the 1971 Constitutional Convention. 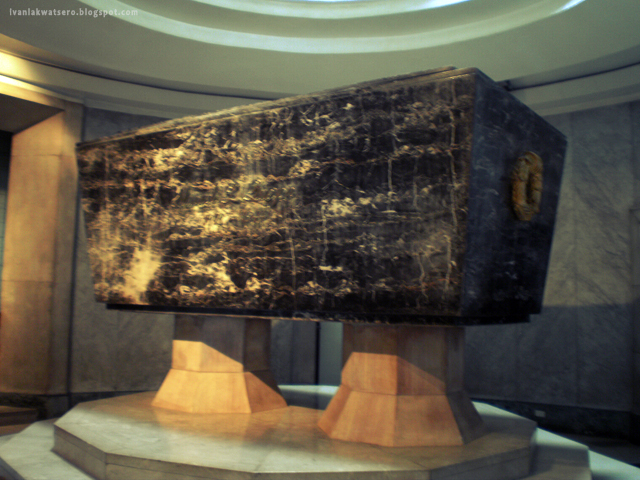 He was interred at the Libingan ng mga Bayani. My Visit: April 4, 2011. Visited the grave at LNMB last April. Read more here. President Diosdado Pangan Macapagal died of heart failure, pneumonia and renal complications at the Makati Medical Center on April 21, 1997. 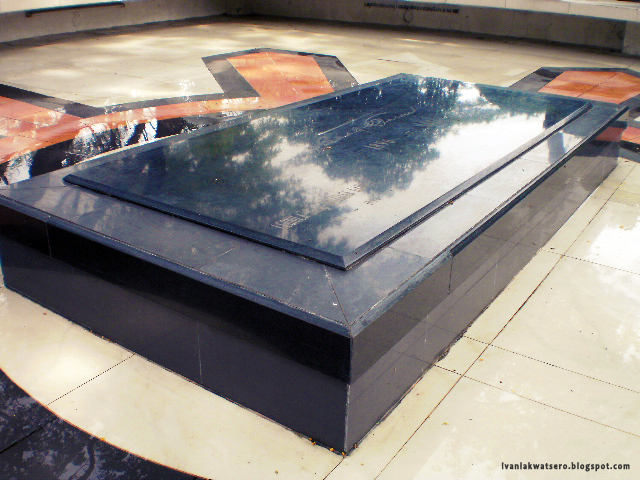 He is buried at the Libingan ng mga Bayani. My Visit: April 4, 2011. Also at LNMB. Read more here. 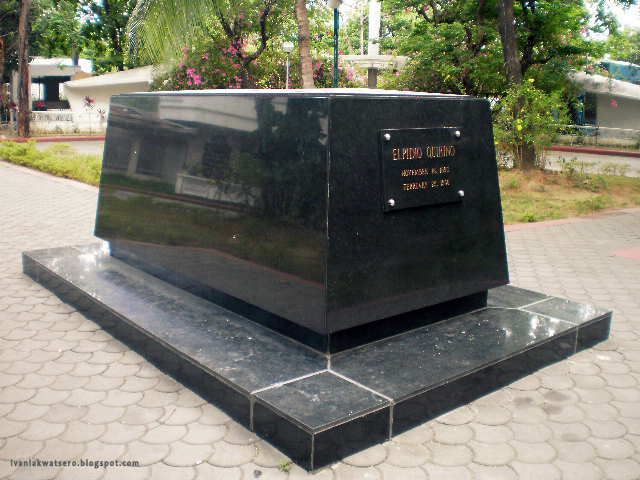 President Ferdinand Emmanuel Edralin Marcos died in Honolulu on September 28, 1989 of kidney, heart and lung ailments. He was interred in a private mausoleum at Byodo-In Temple on the island of Oahu, visited daily by the Marcos family, political allies and friends. 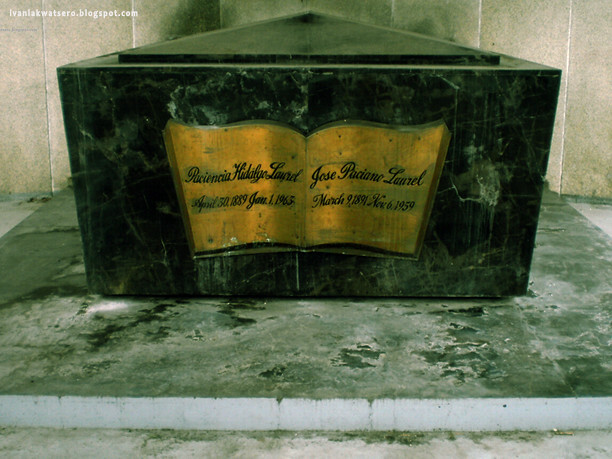 The late strongman’s remains are currently interred inside a refrigerated crypt in Batac, Ilocos Norte. My Visit: April 16, 2010. I visited the crypt last April 2010, taking pictures inside is prohibited. Read more here. President Corazon Cojuangco Aquino was laid to rest beside her husband, the late Sen. Benigno Aquino, Jr. on August 5, 2009 at the Manila Memorial Park in Parañaque City after a year-long battle with colon cancer. Aquino died of cardio-respiratory arrest which are complications of colon cancer at the age of 76 on August 1, 2009, 3:18 a.m., at the Makati Medical Center. My Visit: April 9, 2011. 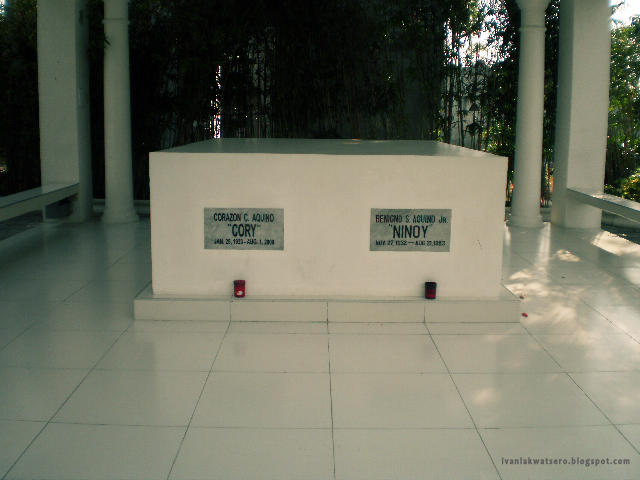 I visited the simple white tombs of Tita Cory and Ninoy last April. Read more here. *Texts taken from this Manila Bulletin article. This is my entry to this month's PTB Blog carnival hosted by Gael Hilotin of the Pinay Solo Backpacker with the topic: "Dark Tourism: Philippines in Focus"
nice and informative post.i only have pictures at tita cory and aguinaldo!good read!! Presidential tombs. Nice one! Ang galing mo Ivan! 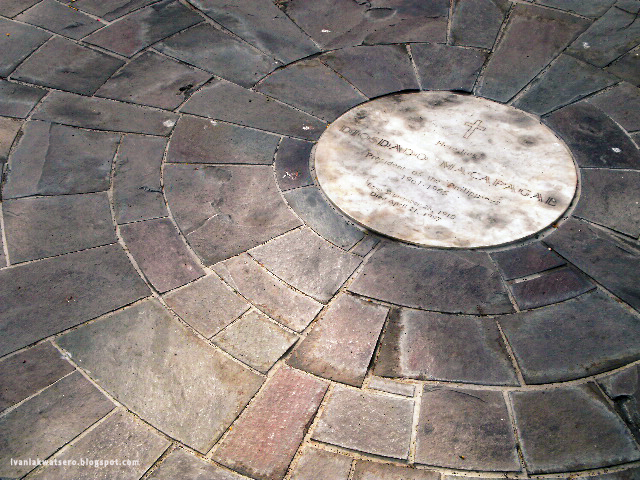 This post is informative, historical & fits the theme of Dark Tourism. I really find all your blog carnival entries unique and fun to read! :) Great work. wow! ang galing Ivan..very impressive post, talagang pinaghirapan! kanina ka lang pumunta sa tanauan, buit nakita mo agad! Sorry hindi kita nasamahan..lakas ng ulan noong weekend. kinilabutan ako.. they may be great people, but still theyre dead. 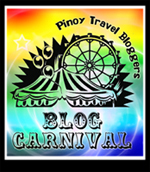 achieve sa blog carnival theme! wow Ivan bilib na talaga ako sa yo. gusto ko rin ma try yan ginagawa mo...dapat mag Chinese cemetery naman tayo one time at ikutin ang San Miguel na rin sa Manila. congrats sa post na to! @tita mhe-anne, salamat po. visit mo na rin yung ibang tomb. @AJ, speaking of Apong Macoy, kawawa naman sya kasi hndi pa rin sya malilibing sa term ni pres. Noynoy. @darwin, galing ako sa Tanauan kanin, feeling ko nga tinaga ako nung tricycle driver e..
@Je, tara, gusto ko mapuntahan yung lumang simbahan sa Chinese Cem. Hanga talaga ako sa mga posts mo Ivan! Ivan, I always sense your "efforts" in every blog you write. 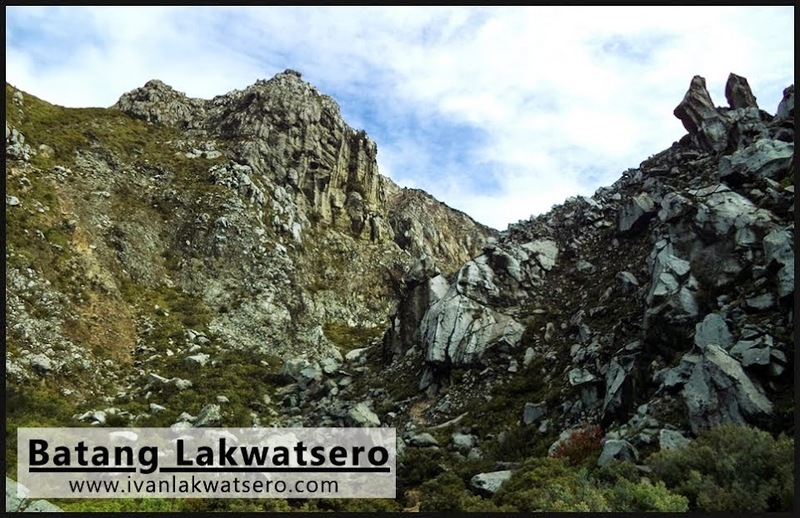 Talagang pinag-isipan,at pinag-aralan. Hats off to you, Ivan. Ang galing nito! I also admired this post. very informative. especially the middle names of the presidents. Isa pala sa kanila ang middle name ay Polistico. I have a close friend na ganun ang family name. Congrats, ivan. Malayo pa ang mararating mo. :-). Great Collection! Ang galing mo talaga. Nahiya ako bigla sa mga posts ko. hahah! Walang wala. Para kang si Hoobert. Tinatalbugan ang Sibika at Kultura books. hihihi! Galeng! @Reuben, hehe.. parang gusto ko nga magtrabaho sa DOT. @Tita Lili, salamat po.. matindi lang tlga ang love ko sa history..
@Sir Bon, salamat po. mahusay tlga yung source ko. @Ed, lol.. takot ako sa mga interview. haha.. magtatago ako sa december. @Kura, salamat.. ano meron kay Hoobert.. bihira lang ako mapdpad sa site nya e.. peyborit ko ang Sibika at Kultura..
Ivan , kaw na talaga . Galing klap klap! Okay, so I'm not really a fan of tombs, but Ivan this is a walk through history. Very informative. Thank you.